Jack White covered his Boss CS-3 Sustainer pedal in bronze plating, which is in line with the look that he uses for the Raconteurs. A Boss CS-3 Compression Sustainer Pedal is seen at 0:05 in this rundown video of Mike Einziger's pedalboard. In [this Music Radar article](http://www.musicradar.com/news/guitars/u2-exclusive-the-edges-stage-setup-revealed-223342/10), the Edge's guitar tech (Dallas Schoo) details The Edge's setup during the 360 tour. His Boss CS-3 is listed among his outboard pedals. Synyster Gates talks about his Boss Compression pedal in this interview about his gear with Guitar Center at 4:24. Syn says, "I pretty much just run the boss blue compressor, CS-3, I think. That just give it kind of just this natural sort of, what is that kind of stuff called? Um, I don't know. It just beefs it up a little bit but it doesn't sound synthetic. It just sounds really nice. It's just a very natural, whatever it does, sound." Vince Gill uses this stock CS-3 Compressor for live work (originally sources from "Vince Gill’s Touring Gear", an article from premierguitar.com)..
Brad Delson, Linkin Park guitarist, uses the two Boss CS-3 Compression Sustainer Pedal on his pedalboard at 2:25. At 5:48 Paul Gilbert uses the Boss CS-3 Compression Sustainer Pedal on his pedalboard. (4:40 minute mark) - one of the pedals sitting on the shelves is Boss CS-3 compression sustainer. In this diagram made by Boss, the Boss CS-3 compression pedal is visible. In [this image](http://imgur.com/4OBkwLG) from [Underworld's Instagram account](https://www.instagram.com/underworld/), Karl posted a photo of his old pedalboard, which included a CS-3. "Another compressor. This is my “one louder” pedal. There are certain times in a gig when you need to turn up when everything is already ridiculously loud. This does that. I only use it a couple of times a gig." At 18:40 in this video rig rundown, Adam Day, Neal Schon's guitar technician, mentions Schon's Boss Compressor Sustainer. Marc Rizzo talks about his Boss Compressor in [this interview](http://www.funksheet.com/2009/07/marc-rizzo-soulfly-gear.html). He says, "I run my acoustic guitar through a compressor…"
According to Boss' rig diagram, Pittman uses the Boss CS-3 compression pedal. As you can see from the picture from Tom's instagram, in his studio, he owns/uses the Boss Compression Sustainer. According to Reverb's website, his pedalboard for the "Hell Freezes Over" tour included the Boss CS-3. Although it could be unclear whether this pedal is actually CS-3 or CS-2, this is CS-3, judging by the number of knobs. CS-3 has 4, and CS-2 has 3 knobs, positioned triangular. In this Instagram photo you can see the Boss CS-3 Compressor Sustainer in Matt's pedalboard. As seen in the Instagram pedalboard shot, the Boss CS-3 is part of Adam Hann's pedalboard. Juanma got it in through the loop signal mixed in the Proco Juggernaut, with his drive section. Juanma explains the pedalboard he usually used in this radio/internet show called ''Masterclass 6x3'' by Sergio Bustamante in Radio 3, the spanish public music radio. [This photo-article from MusicRadar/*Guitarist* magazine](http://www.musicradar.com/guitarist/manic-street-preachers-james-dean-bradfields-gear-280353) details all of the gear Bradfield used during the making of the Manic Street Preacher's 2010 album *Postcards From a Young Man. * The CS-3 (boxed, at left) is depicted in James' pedal collection. Here's a rig just finished for Jeff Schroeder of the Smashing Pumpkins. In this Instragram photo from Sept 2016, we see a shot of Jessica's current pedalboard. The Boss CS-3 Compression Sustainer can be seen in the upper right. 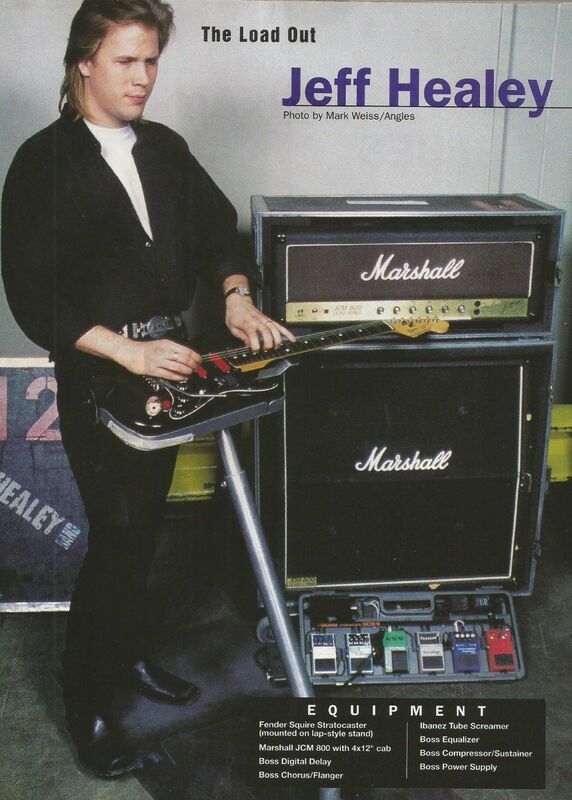 On this photo Jeff Healey's pedalboard contains a Boss CS-3. Nels Cline uses a Boss Compressor Sustainer to squish his sound. "People laugh at [it], but I still love [it]," Cline says at (25:00), "particularly because it just squishes on with their latch switch thing." Ira uses a Boss CS-3, according to Guitar Geek's [rig diagram](http://www.guitargeek.com/ira-kaplan-yo-la-tengo-guitar-rig-and-gear-setup-1996/). At 19:28, Dave mentions his Boss CS-3, and says that he uses it to reduce the level of his output so that he can quietly record samples between songs during the live set. Seen at 1:23, can be assumed to be the same as Paul's. This 2009 pedalboard was designed for Lightbody by LA Sound Design. One of the pedals in his pedalboard is the Boss CS-3 compression sustainer. "It's different than a rack compressor"
CS-3 seen 2nd from bottom right on Dave's board. **THIS MAY BE COMPLETELY WRONG!!! JUST AN EDUCATED GUESS!!! ** In this photo, you can see what looks like the Boss CS-3 Compression Sustainer on Josh Paul's pedalboard. From the viewer's perspective, the pedal is the 2nd from the right-most pedal on the pedalboard. From Josh Paul's perspective, the pedal is located on the closest (i.e. bottom) row and is the 2nd from the left-most pedal on the pedalboard. **EDIT:** This is actually a Boss PS-5 Super Shifter!! 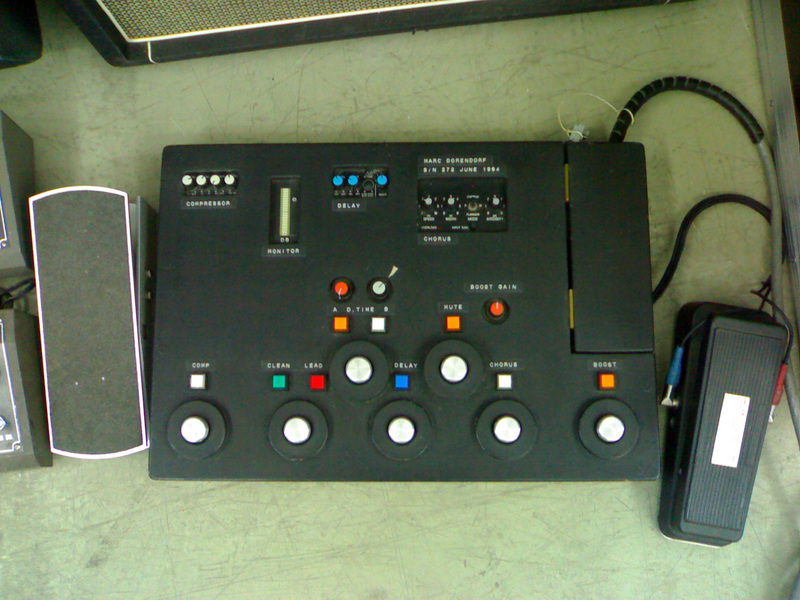 At 18:30 Mr. Reynolds displays his pedalboard and in the right corner directly to the left of the [ZVex Fuzz Factory](http://equipboard.com/items/zvex-vexter-series-fuzz-factory-guitar-effect-pedal) sits the Boss CS-3 Compressor. In this photo, we can see bits of Krompass' pedalboard, and one of the pedals is the Boss CS-3 compression sustainer. According to Guitar Geek's [rig diagram](http://www.guitargeek.com/adam-franklin-swervedriver-guitar-rig-and-gear-setup-1998/), Adam uses a Boss CS-3. According to Premier Guitar's article, Hartridge uses the Boss CS-3 compression sustainer pedal. In the begining of this video Jon turns on what seems like a boss cs 2 or 3. "I’ve used that pedal before in the past. 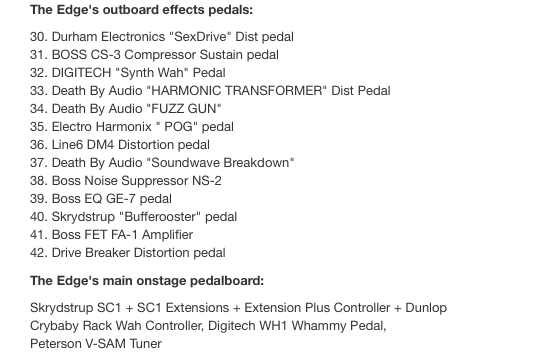 Some of the other BOSS pedals that I have that I’m really digging…I still bust out the classic blue [CS-3] compressor. It has a really distinctive sound." In this Photo from his Myspace you can see a Boss CS-3. In a 2013 video, Mark shows a rundown of his gear beginning with his pedalboard. This pedal can be seen at the 0:12 mark. According to Guitar Geek's [rig diagram](http://www.guitargeek.com/zach-myers-shinedown-guitar-rig-and-gear-setup-2011/), Zach uses a Boss CS-3 pedal. According to [Guitar Geek](http://www.guitargeek.com/peter-koppes-the-church-2011-guitar-rig-and-gear-setup-diagram/), Peter uses a Boss Compressor Sustainer. 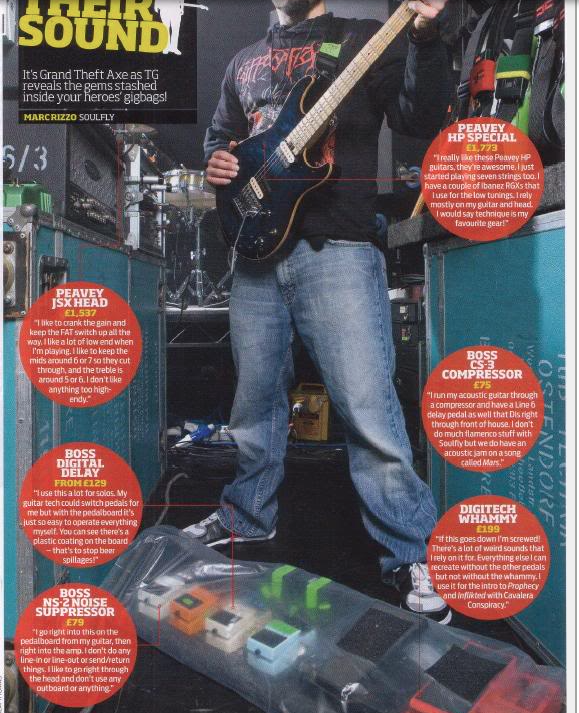 In this Sound On Sound article, there is a photo of Hawley's pedal board, which includes a Boss CS-3. In this photo, which shows Hatherley rehearsing with Nazca Lines, the Boss CS-3 can be seen. "But Ricky was really the main reason I turned to electric guitar, and I must tell you, for all the folks listening out there, the first pedals I really got turned on to were BOSS pedals. Moving to Nashville in ’96, I had a little BOSS treble box, a TU-series tuner, the CS-3 Compressor, the BD-2 Blues Driver, and a DD-3 Delay." "The guitar plugs straight in to the compressor etc. I feel this gives the best tone for what I am doing." Doyle used this pedal during 2015, but he ended up replacing it with Diamond Opto-Compressor pedal. interesting for the new record? If you know well Ben Moder, you will understand that his big chord apparitions controlled by volume pedal, would be quite uncomplete without a good compressor. 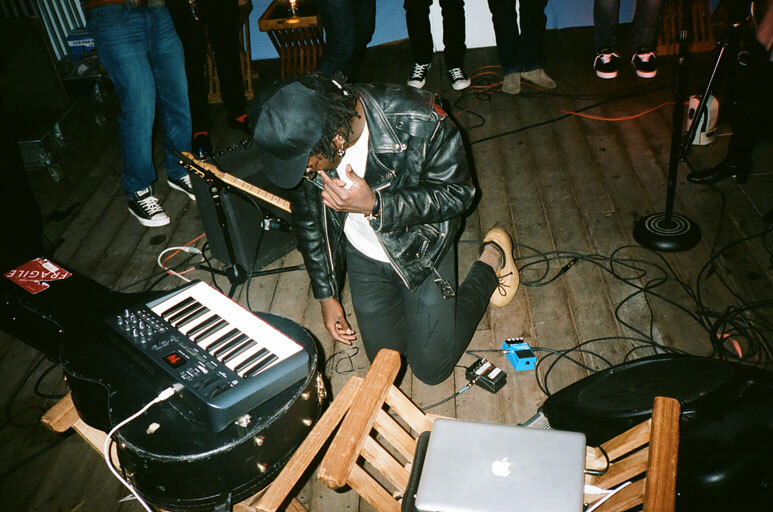 In deed, his sound might be understood first, as a unique setup based on guitar + compressor + amp (little reverb) that's all as a starting point. 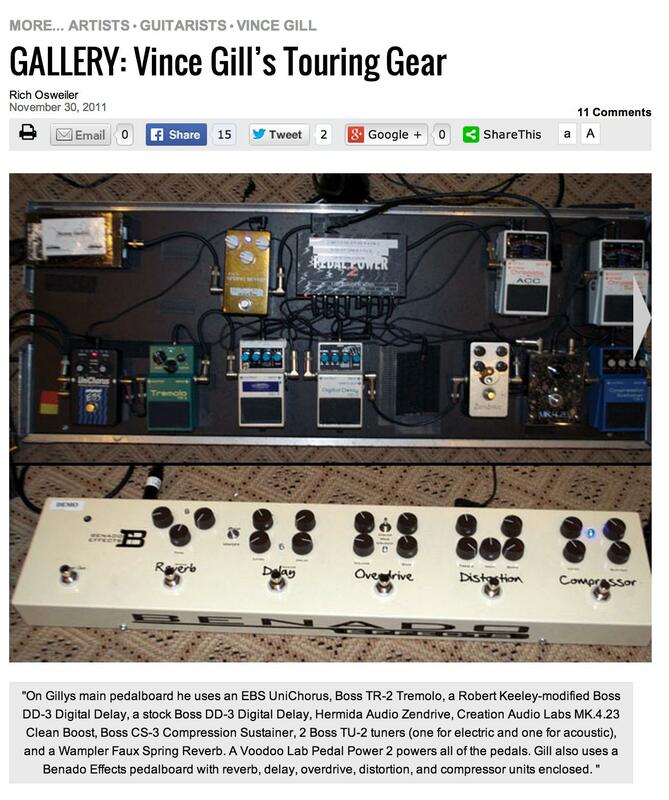 From a [Guitar World Article](http://www.guitarworld.com/caspian-s-guide-creating-wall-sound-four-essential-pedalboard-tricks), Jonny's signal chain continues from the volume pedal to a Boss compressor. According to Premier Guitar's gear list attached with the interview with Boorer, one of the pedals he uses is the Boss CS-3 compression sustainer pedal. The item can be seen 3:45 into this video. This photo was taken in 2011 during Rosenwinkel's concert in The Charles Hotel in Boston. More photos can be seen [here. ](https://www.flickr.com/photos/gsmaz1/sets/72157628179367269) In this particular pedalboard photo, one of the pedals that can be seen is the Boss CS-3 compression sustainer. He used a Boss CS-3 with BlackLion. This item can be seen 2:28 into this video. See on Luna's 2017 tour. I plan on getting a Monte Allums Opto Mod on this pedal at some point. This is a great pedal for sustain, but not very good for a chain pedal board set up. When a pedal needs a mod right out of the factory then you might want to think twice before buying it. I bought it and it was noisy, it altered the tone, the compression went beyond the squishy sound and the sustain option did nothing but add more noise to an already noisy pedal. I got rid of it like a month after having bought it. Doesn't play well with active basses. Kicking this on in a band setting pretty much makes you disappear from the mix. A Classic! Country music in a pedal. Plus all those great 80s sounds. This is primarily a pedal to give you the classic compressed guitar sound. It's easy to dial in and sounds great. If you're a country picker then this does the perfect picking sound. If you want that 80s rock sound, then add some chorus and delay and there it is! Like any pedal, you need to have some knowledge of what you are looking for soundwise, but you won't go wrong with this one, or if you do, it's not the pedal! Just keep the sustain knob on low settings, no more than 9 or 10 o'clock position, otherwise it becomes a little noisey. But it's good, I like it. "A guitarist don't need a lot of pedals, interfaces and effect. He gets a good sound with a clean set up, too"
I use it for my kick drum sometimes to add attack and sustain. The CS-3 does its job, and compresses my bass signal. It works great for me, because it gets really dirty and sounds almost like a bitcrusher, but that adds to my gain and I really like it. As far as my compression is concerned, I have mine dialled to become an effect for my guitar in some songs. The CS3 is relatively confusing to use however it still sounds brilliant. Always on. It makes my pedal chain sounds more clear . Great for that 'squished' sound for funk etc. but it is very muddy if you try to use it with much of anything else. I primarily use it at the end of the chain as a buffer for the long cables. Great comp pedal for guitar! I would have given this Boss comp pedal 5 stars but it tends to be a bit noisy at times. My tele doesn't quieten it down any either! haha! The Boss pedals from the 80's have a special place in my rig! haha! They are fantastic! When I was a teen they were great tools to piss of my parents! I always heard "is that an airplane landing" or " you sound like youre in a cave"! HIss City is right though. I remember hearing bacon frying at times! haha! I'm still getting to grips with compression but it definitely seems to smooth the overall sound in the chain out. Good tone, volume modifying ability. Can't really tell the compression and sustain yet. I wouldn't recommand this pedal. I was looking for something very discrete and it's just not. I just couldn't find a way to make it sound good. I can get a great tone with this pedal and I recommend it to anyone who is looking for a sustain pedal! Not a fancy compressor, but does what I need it to. Good pedal and easy to use. You can get good country tones, for exemple! Good Compressor, but a little bit noisy; very difficult to make it work well with acoustic guitar. For electric guitar is a good cost benefit. Thanks for the comment jimmarchi1 ! I had one of the older, Japanese models (it needed an ACA as opposed to a PSA adapter). Every now and then, I got a good sound out of it. It sounded fine when it was pushing some light overdrive, but on a clean sound, I found the sterile edge it gave to my sound that was too overwhelming to be enjoyable. It somehow sounded too bright without having any high end; something about it was super piercing, and I didn't find it enjoyable. Maybe newer models sound a little different, but I was expecting something close to the transparent brilliance of the CS-2, and I was quite disappointed. For their low-ish price point, you'd be better off with a CP-1X, and you can even find some great deals on the old CS-2s.